We look forward to welcoming you to the 4UR Ranch, a luxury Colorado Ranch Resort! Please contact us for information or reservations via telephone or email. 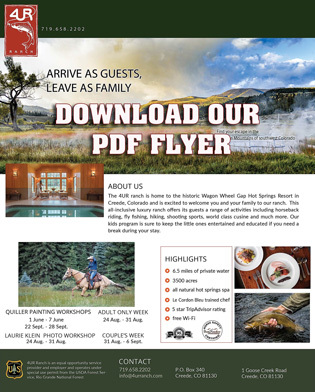 We look forward to talking with you about your Colorado fly fishing vacation at the 4UR Ranch. On stays of less than one week but more than three nights, please prorate from weekly rate. Excluded from your daily rate are alcoholic beverages, fishing guides services, massage appointments, and theatre tickets. Please plan to book guides, massages and theatre plans before your arrival. Contact us and we'll be happy to make those arrangements!